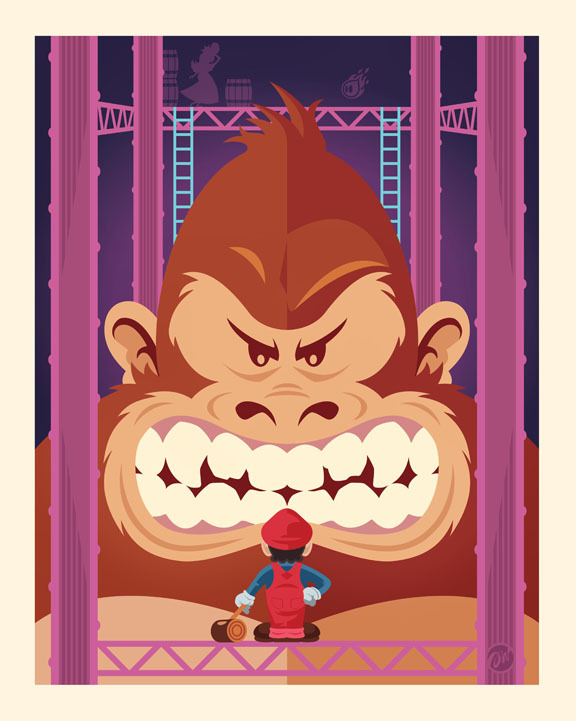 The following pair of Donkey Kong-inspired illustrations recently popped up on one of my favorite art blogs, The Autumn Society, and because I consider myself quite a fan of the big ape, I thought I'd post them here, too. The illustration below was created by an artist who calls himself (herself?) Chogrin for the "8-Bit Champions" show that's set to open in Paris on Sept. 15. This piece, on the other hand, was produced by artist Jayson Weidel for the "Old School Video Game Show" that will kick off on Sept. 16 in Santa Monica, California. Now, please forgive me while I play a few rounds of Donkey Kong on my trusty Twin Famicom. Mario looks like wario....I approve. The classic Donkey Kong game was one of my favorite arcade games of all time. King of kong is a great documentary over it. Hey there, Joe/John/Frank/whatever-your-name-is! Don't worry, I kid :P Are all of you the same person, though, or am I just getting a number of one-named visitors these days? 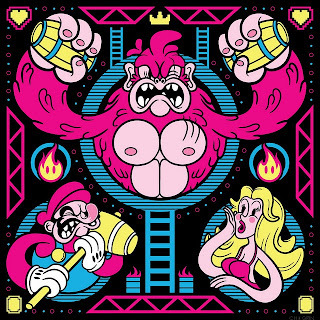 Anyway, yes, Donkey Kong is an all-time great, no doubt. You're the second person today to recommend King of Kong, by the way. Guess I'll have to check it out soon! That second image is pretty sweet. Ah, that's interesting, Justin! I thought everybody would prefer the first image. Well, fingers crossed someone, somewhere is working on such a game. Really, Donkey Kong is due for a bit of a reboot, a la Donkey Kong GB, don't you think?